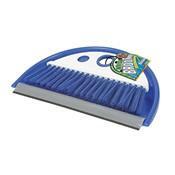 Dust Pan w/ Whisk Broom. Small size makes it easy to keep this handy duo close at hand. Whiskbroom snaps into dustpan when not in use. Hanger-hole for convenient storage.